As Europeans begin to ask more questions about where their meat comes from and sales of supermarket beef drop, I think it’s a good time to share a recipe that champions good quality beef in a very comforting way. 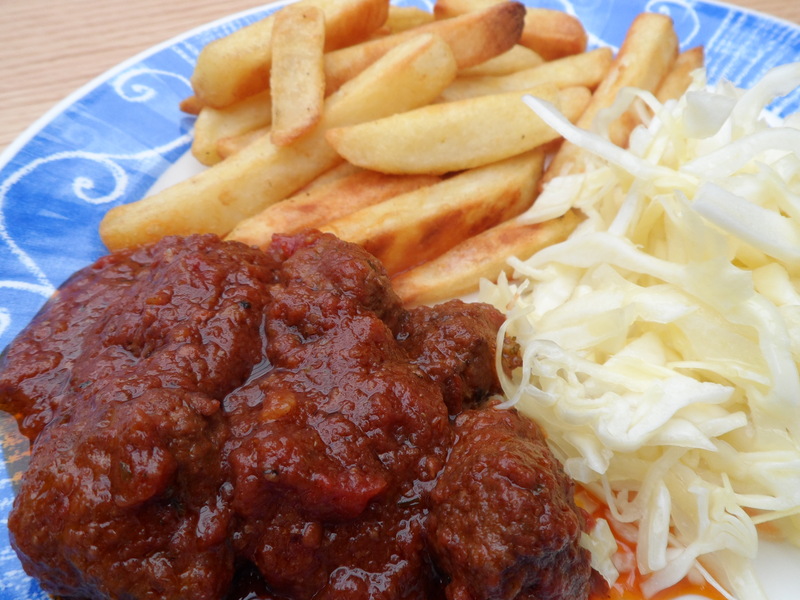 I love meatballs and there are some great recipes out there. Already, I’ve shared my recipe for Keftedes (Greek meatballs), but today I want to share one for soutzoukakia (soo-zoo-ka-ki-yah). 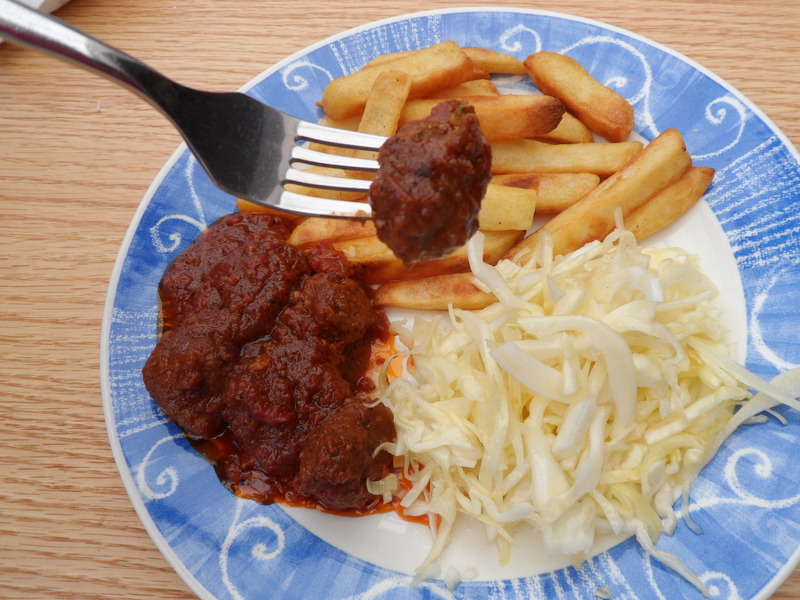 These are usually little sausage-shaped meatballs which are more like kofta and are served in a tomato sauce. They’re gorgeous and a little spicier than ordinary meatballs. My mum makes killer meatballs, maybe the best, but my recipe comes close; certainly close enough that I feel no shame in sharing it with you. These beauties melt in the mouth and will permanently stain whatever clothing they touch, so cover up when you tuck in. They’re great with all kinds of food, but I love them with a fresh cabbage salad and chunky chips. They freeze well too, so make a big batch and then tub it up for a rainy day. We had some on pasta recently and it was a real treat! Make breadcrumbs with the white bread and pour into a large mixing bowl with the beef. Puree the onions and garlic in a food mixer and add to the beef. Next, add all of the meatball ingredients to the bowl and use your hands to squeeze everything together until fully combined. This takes some time and is best done when the minced beef is at room temperature. You can leave the mixture overnight to let the flavours develop, or you can get on with making the meatballs. Wash your hands well and leave them wet if you are going to make the meatballs immediately. This prevents the mixture from sticking to your fingers. Break off small chunks (or whatever amount you would like) and roll into a little ball. Set to one side ready for frying. In a large casserole, gently heat enough olive oil to cover the base. Add the meatballs in batches and get some nice colour on them before removing them. Let them drain on kitchen paper in a bowl. When all of the meatballs have been cooked, keep the heat low and add the red wine to deglaze the casserole, stirring all the time with a wooden spatula or spoon. Get all of the bits of meatball off the base and add the tomatoes and the beef stock. Bring to a rolling boil and stir gently for around two minutes; just enough time to burn off the alcohol in the red wine. Lower the heat and stir in the puree. Bruise each garlic clove before throwing into the sauce. Finally, add the dry ingredients and stir. Once the sauce is simmering, gently add the meatballs and add enough stock to cover them. Keep the sauce simmering for at least an hour with the lid off to reduce the liquid. Stir from time to time and stop cooking when the sauce is nice and thick (or to your liking). Taste the sauce and season it if necessary. Remove the bay leaf before serving. The good news is that soutzoukakia can be served with all kinds of things. As I said earlier, I love them with chips and a crunchy cabbage salad, but they’re just as good with mash, roasted potatoes or in a hot baguette with some grated cheese on top! You gotta love meatballs! This entry was posted in Soutzoukakia and tagged food, Greek, meatballs, meze, olive oil, Soutzoukakia, tomato sauce by Dimitri @ The Last Piece of Cake. Bookmark the permalink.